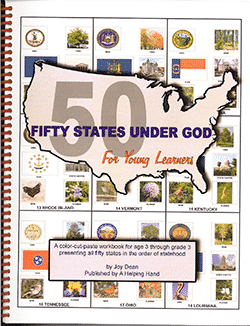 Study the history and geography of each of the United States with this 50 states curriculum. Student-friendly formatting with five chapters of text and five student activity booklets. 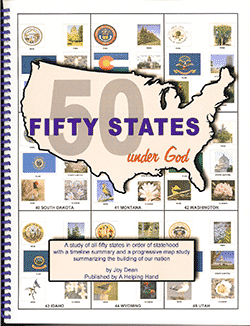 Study each state’s original inhabitants, founders, and prominent men and women. Features include capitals, major cities, industry, sports, religions, tourist attractions, agriculture, and ranching. Each lesson emphasizes a famous role model vignette. Maps, charts, and graphics enhance comprehension and understanding. Positive life principles embellish each lesson. The Paradigm Histography: A Survey of the 50 United States Digital Download Course Kit includes everything you need to complete the course in digital format: Text, Activities, and the Teacher’s Resource Kit, all in PDF format. It covers the same information as the print version. 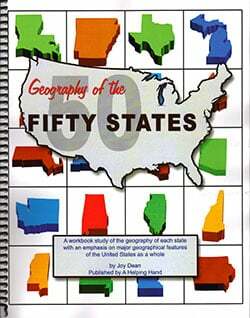 The Histography: A Survey of the 50 United States Text Booklet Set includes one of each of the text booklets for Chapters 1 to 5 for the additional student. The Histography: A Survey of the 50 United States Activity Booklet Set includes one of each of the activity booklets for Chapters 1 to 5 for the additional student. The Histography: A Survey of the 50 United States Teacher’s Resource Kit (TRK) has the Activity Keys, Quizzes, Quiz Keys, Tests, and Test Keys.